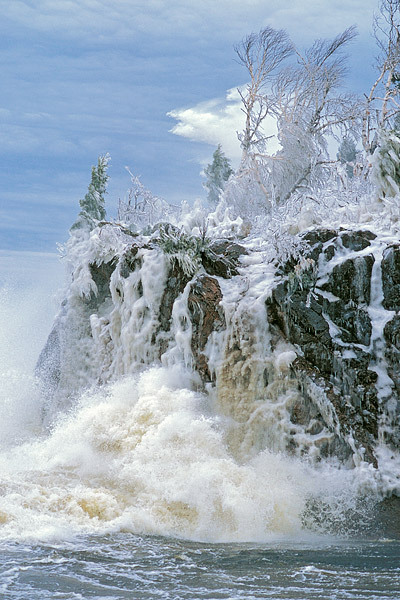 Gale-force winds and sub-freezing temperatures create an otherworldly scene at the outlet of the Baptism River into Lake Superior. As the massive waves crashed against the shoreline cliffs the water instantly froze, coating this rock outcropping (and photographer!) in a shell of ice. The wave rising behind the trees at the top of the cliff is more than 30 feet high. Field Notes: Minolta Maxxum 7 camera, Minolta 100 2.8 macro lens, Fuji Provia film. Photo © copyright by Brett Deacon.